Dream FM 106 is one of the most famous online radio station on the Pakistan. In these days Music is the very popular entertainment and provides enjoyment to the listeners to help express emotion. 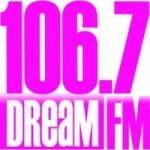 Dream FM 106 brings the best and different kinds of music to their listeners. This Radio has some of the best DJ’s in the world because of which they provides best musical shows trying to strive their best to complement their listeners musical experience with the best possible entertained music. It is very popular Radio due to their good sound quality and good service ability. and powerful medium reaches across to the listeners who like good Music. This Radio is very popular in young culture to listen latest music, young culture music, you can listen the songs, stylish music, and latest updates. QUALITIES & WONDERS OF THE Dream Fm 106 For The Love Of Music Transmission RADIO!!! The Dream Fm106 For The Love Of Music Transmission Radio is first Pakistani Internet Radio company, which has listener ship in Pakistan, India, U.K., U.A.E, Saudia, Dubai, Emirates Estates, Abu Zehbi, Malaysia, Japan, Africa, Indonesia, Fiji & U.S.A without sponsorship to the whole world.